Paula Deen coming to brunch and you dont know what to serve? Okay, maybe not! 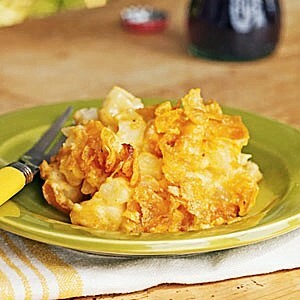 But she could be and shed be thrilled with this cheesy hash brown casserole thats so packed with cheesy goodness, even Paula wouldnt miss the fat! Seriously, this is reeeely good! Ive taken it to many a potluck and come home with an empty dish in fact, my friends request that I bring this cheesy hash brown casserole. Combine soup and cheese in a medium microwave-safe bowl. Microwave at HIGH 6 minutes or until cheese melts, stirring every 2 minutes. Stir in sour cream. Pour cheese mixture over potato mixture, and stir well.